The 416 Fire was 34,224 acres and 37 percent contained as of Friday. 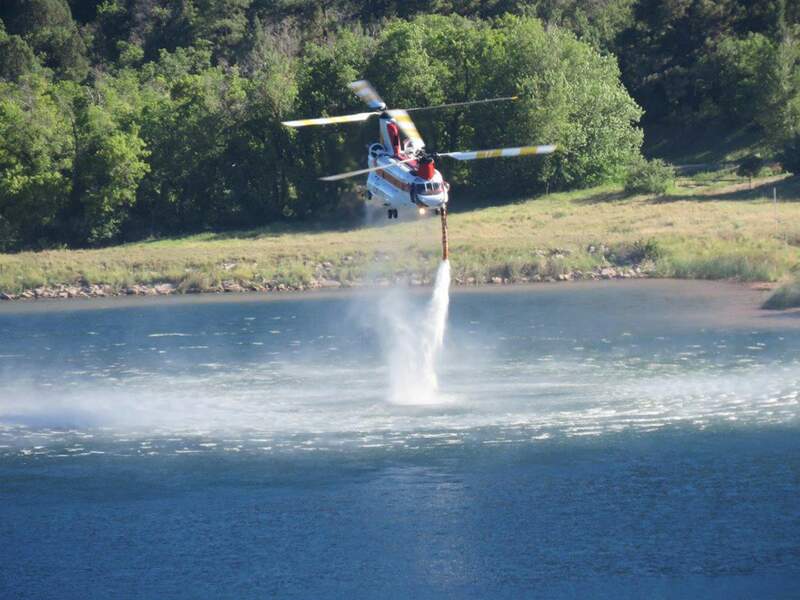 A Chinook helicopter fills up with water earlier this week while working the wildfire north of Durango. A National Incident Management Organization team assumed command of the 34,224-acre 416 Fire at 6 a.m. Friday. NIMO, a Type I team, has fewer personnel than the management team it replaced but has access to more resources if needed. As of Friday, 548 firefighters and three helicopters were working the blaze. The NIMO team will continue to monitor the weather as hot and dry conditions persist across the region. The area was under a red-flag warning Friday and will be under another red-flag warning from 10 a.m. to 9 p.m. Saturday. The National Weather Service also issued a “fire weather watch” from 11 a.m. to 8 p.m. Sunday. Fire officials said most of the activity Friday would occur in the northwest corner of the fire, far away from any residences. “The places they were most concerned about an increase in fire activity was kind of away from the areas that we had been previously worried about,” Knight said. The fire was 37 percent contained Friday. Crews continued to assess areas where the fire is contained to monitor any heat sources near the containment lines. Hot-shot crews have been creating an indirect line on the southwest perimeter of the fire, but activity in the area has decreased during the last couple of days. Crews are also beginning rehab work on the fire, which includes installing water bars to help prevent runoff. Before the monsoons arrive, a Burned Area Emergency Response team will assess post-fire conditions. County Road 205 reopened to full access Friday afternoon. Pre-evacuation notices remain in effect for Falls Creek and High Meadows subdivisions, as well as for residences and businesses on the west side of County Road 203 from Trimble Lane south to the U.S. Highway 550 intersection, the 1000 block of County Road 204 to the Colorado Trail access, and County Road 205 north from the intersection of County Road 204 to the Falls Creek Ranch subdivision entrance. Stage 3 fire restrictions remain in effect for unincorporated areas of La Plata County and county-owned trails, open space and unimproved land, which means they are closed to public use. The cost of firefighting efforts was $20.5 million, according to the most recent estimate available Friday.